Behre Dolbear participated in the 2nd Russian-UK Raw Materials Dialogue, in London, on October 24th, 2018. Participants of this very well-attended gathering discussed ways for increasing cooperation in natural resources sector between the two countries. 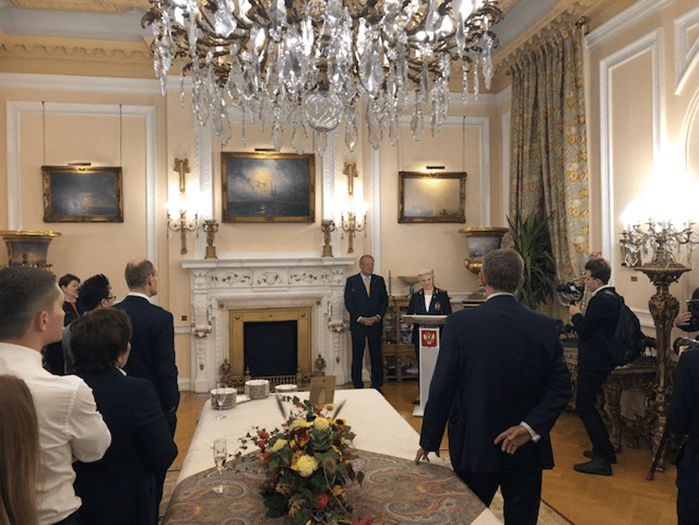 After a long day of talks and panel discussions participants were kindly invited to take a red double-decker bus scenic London tour and concluded the evening in the residence of Russian Ambassador, in his impressive residence in Kensington. Greeting from Russian Ambassador and Rector of St. Petersburg’s State Mining University. 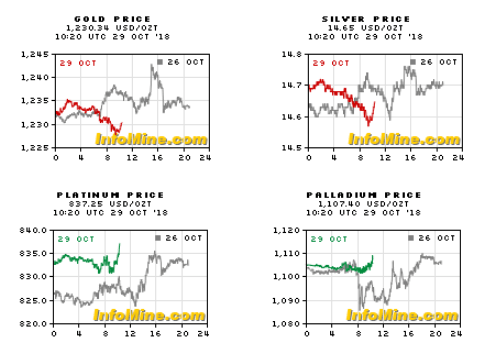 Gold returning to financial system apex? 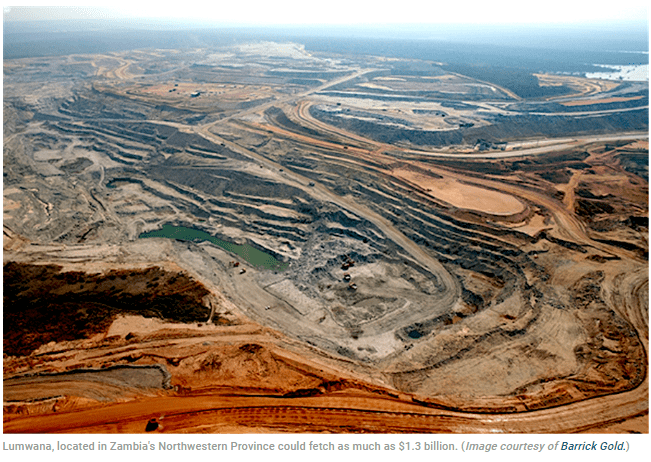 The expert believes the largest potential deal would be Barrick’s Lumwana copper mine in Zambia, which could fetch as much as $1.3 billion. The merged mining company may also sell its 50% stake in Chile’s Zaldivar mine, its majority stake in Tanzania-focused miner Acacia, as well as Randgold’s Tongon, Massawa and Morila assets, Kaip wrote in a report to investors. RIYADH, Oct 25 (Reuters) – Saudi Arabian Mining Co (Ma’aden), the Gulf’s largest miner, is actively looking for investment opportunities overseas that would complement and strengthen its business inside the kingdom, the company’s chief executive said on Thursday. Davis said he was optimistic about the company’s outlook, especially in 2019 when it will operate at full capacity, although he said its debt – long-term borrowing totalled 49.8 billion riyals at the end of September – may weigh on results. Uncertainty over global trade could also dampen growth in the commodity business for some time, he added. A vibrant Australian Nickel Conference in Perth this week featuring analysts and brokers among the attendees showed belief in the return of the good times for the Australian sector is growing, though there’s one big elephant in the room that’s more or less a hangover from the huge party enjoyed last decade. 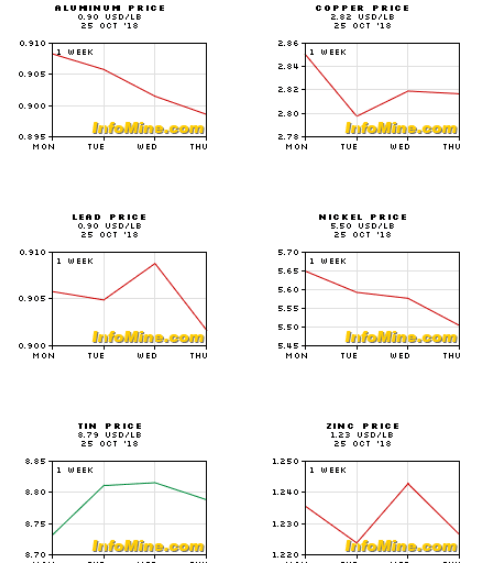 Last time round the nickel price spiking into unchartered territory resulted in the emergence of the Chinese nickel pig iron sector (NPI), a big player in the nickel market to this day. Such has been the adaption and efficiency of the Chinese NPI players that the Indonesian Morowali Industrial Park built by the world’s largest stainless steel producer, Chinese company Tsingshan, is considered by no less than Glencore as “arguably the lowest cost ferro nickel operation in the world”. Which is quite a contrast to how the sector was initially perceived (and downplayed), by conventional nickel producers around the turn of the decade. Back then the NPI sector was viewed as being just a high-cost group of producers only able to swing into action when the nickel price moved to levels well beyond the norm. Tsingshan et al have effectively put that assessment to the sword. The question now for the increasingly buoyant nickel sector is can the Chinese swing into action with the laterite resources in places such as Indonesia and Australia and learn to efficiently and cheaply produce the nickel sulphate required by the battery sector? And in doing so severely crimp the potential nickel price? The conventional nickel sulphide producers seem to be more or less currently saying two things: no, and even, if yes, so-what? The ‘no’ argument says high pressure acid leaching processing (with sulphur then added into the mix), is a much, much more complex and costly process than that developed to produce ferro nickel for the stainless steel industry. The many billions torched by Western developers over the past 20 years or so offers clear proof of the difficulties (and costliness) of HPAL output. Never mind the added cost of then incorporating the required sulphur. The ‘so-what’ response says the potential exponential growth seen in the battery sector means even if a new generation of Chinese HPAL-type producers emerges, there’s going to be plenty of demand to go around for all suppliers. There could be an ‘interesting’ decade ahead. And the incumbents will clearly be hoping it’ll not be ‘interesting’ ala the Chinese curse. Palladium, a precious metal widely used in the automotive industry, has hit an all-time high. The rally has been fueled by concern over shortages and speculators piling in to bet on even higher prices. The majority of palladium is used to make catalytic converters in gasoline automobiles, and there’s increased demand for the metal as consumers increasingly choose gasoline vehicles over diesel. 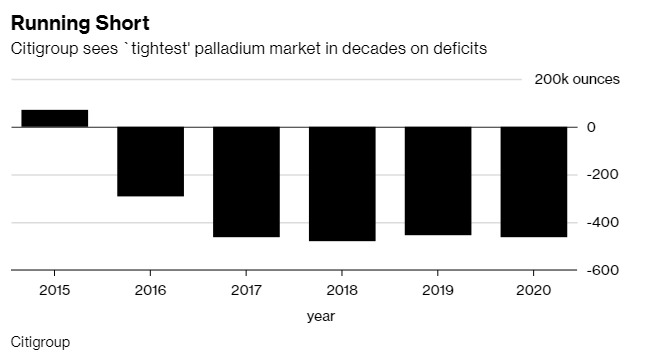 In a year that’s seen losses for most other commodities, the rally in palladium has been exceptional. It’s the one major metal that’s at an all-time high and prices have almost doubled in the past two years. On Tuesday, the metal advanced 1.8 percent to settle at $1,144.20 an ounce at 5 p.m. in New York. It earlier climbed as much as 2.5 percent to $1,152.54. The gold standard was for centuries a global financial norm that ensured the financial system functioned effectively, until it came under threat in the 1930s and was ultimately culled in 1971 by US president Richard Nixon, signalling the official decoupling of the US dollar from gold. The removal of the gold standard had allowed the unshackling of the global financial system and made the creation of unlimited debt possible, Vulpes Investment Management managing director Grant Williams said at the Silver & Gold Summit in San Francisco. He suggested the gold standard could be compared to an apex predator such as the grey wolf, which moderated credit expansion in an economy like a wolf preyed on deer, thus keeping the population in check. “Like the removal of any apex predator from an ecosystem, it might seem at first that there’s no problem, but eventually one will observe a host of imbalances emerge that start to threaten the very existence of the ecosystem,” Williams said. WINDHOEK (Reuters) – Namibia has scrapped a requirement for companies seeking mining exploration licenses to be partly owned and managed by black Namibians, the country’s mining industry group said on Friday. The chamber of mines said on Friday the requirements had been set aside by Mines and Energy Minister Tom Alweendo in a letter to the group. Neither the minister nor officials in his department could be reached for comment. Mining contributed 12.2 percent to the country’s gross domestic product last year. Under the scrapped policy, the management structure of a company applying for an exploration license was required to have a minimum 20 percent representation of black Namibians. At least 5 percent of the company also had to be owned by Namibians or by a company wholly-owned by Namibians. Namibia gained its independence from South Africa in 1990 and the former German colony suffered from apartheid-style rules, with the white minority controlling most of the economy.Mbako said the requirements and uncertainties created by the planned New Equitable Economic Empowerment Framework (NEEEF), a regulation intended to force white-owned businesses to sell 25 percent stake to blacks, had hit investor confidence in Namibia. JOHANNESBURG, Oct 26 (Reuters) – Diversified miner Vedanta is investing up to $800 million in a zinc smelter in South Africa, the head of its zinc unit Deshnee Naidoo said at an investment summit in Johannesburg on Friday. An obscure silver-while metal, found in higher concentrations in moon rocks than on earth, holds promise to transform manufacturing of planes and cars and is receiving a strong boost from the boom in battery metals mining. Addition of the metal to aluminium improves the weight, strength and malleability, dramatically reducing the weight for parts for aircraft, cars or ships and help deliver savings on fuel costs. Vice president for business development and scandium marketing at Clean TeQ Holdings Ltd adds “it’s the single most potent strengthening element you can add to aluminium. Why scandium is so interesting is that if you add very, very small amounts of it – its has amazing impacts”. The big problem has been a lack of supply. This is being improved by the arrival of new mines that’ll yield scandium as part of the process of producing the cobalt and nickel needed for lithium-ion batteries. Extracting all three materials from a single deposit, rather than focusing only on producing scandium, drastically improves the economics. “It more or less gets a free ride along with the cobalt and nickel,” said Clean TeQ, “The cost of production is significantly less” according to Australian polymetallic developer. 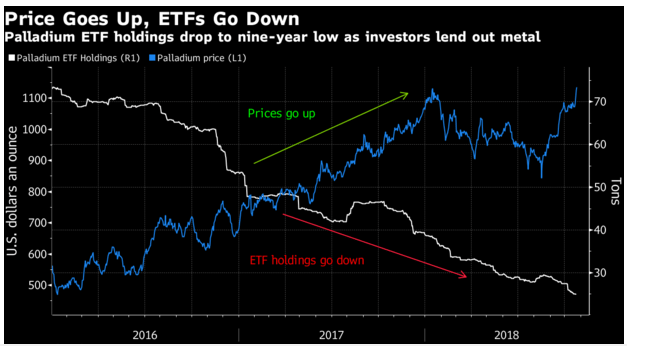 Wider adoption has proved more difficult, with the sector stuck in a conundrum: global output of scandium had been too small to give potential users such as aerospace companies confidence there’d be a reliable, long-term supply — a factor that’s also kept prices high. Yet without certainty about demand, producers have been unable to commit to developing operations. 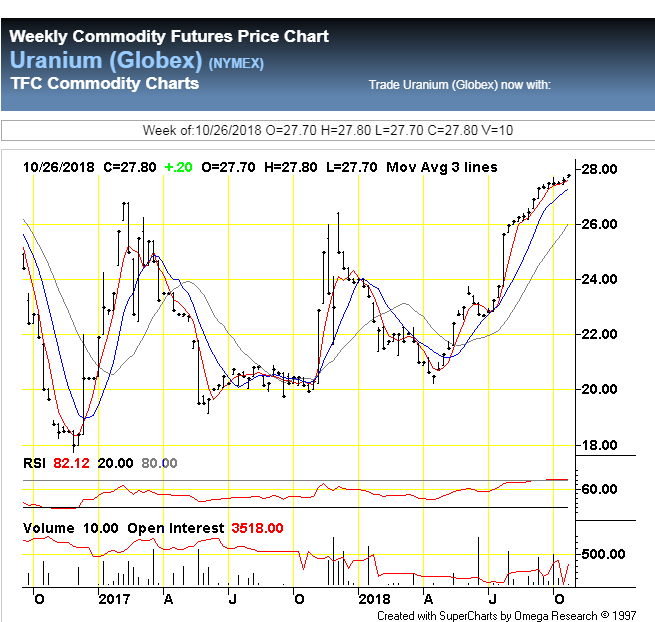 Changing demands are creating new requirements, with Japan’s Sumitomo Metal Mining Co. entering production in the Philippines, while United Co. Rusal is studying plans to add scandium output following tests at its Urals smelter. In Australia, Clean TeQ’s Sunrise mine is intended to be up and running in 2021, while Australian Mines Ltd. and Scandium International Mining Corp.are among others developing assets. Centennial, Colorado-based NioCorp Developments Ltd. is developing a mine in Nebraska. 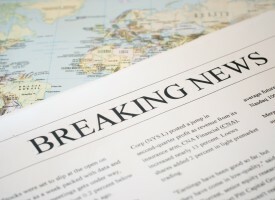 “As new supply comes online some of the latent demand will be unlocked,” said Will Ayre, a London-based consultant at CRU Group. “The aerospace industry is one of the obvious sectors where scandium consumption might increase dramatically. Tiny reductions in aircraft weight can lead to significant fuel cost reductions.” The current market for scandium oxide is about 15-20t/year, and a switch by the airline industry to replace 30% of aluminum consumption with aluminum-scandium alloys could lift demand to about 80t/year, according to Ayre. Adoption by the auto sector would be a potential game-changer, according to CRU. Using scandium alloys to replace even a small proportion of aluminum used in vehicles would require enormous volumes, potentially lifting demand to more than 1,800t by 2035 — vastly more than the capacity of current planned projects. It’s more likely that use of scandium in autos will be limited to some high-end vehicles, Ayre said. Swelling demand and clarity over growing consumption is expected to deliver more stability on prices that have fluctuated between a current level of ~$1,500/kg to as high as $5,000/kg. “Increased demand for vanadium in high-strength steel and accelerating battery metal demand for vanadium flow battery applications has driven vanadium prices from USD$10 to USD$30 during 2018. This large price increase is driven by a global supply deficit, and most notably new Chinese building code standards requiring vanadium rebar strengthening effective next month (November 2018). China, the world’s largest vanadium producer and vanadium consumer, has exacerbated the supply deficit by becoming a net importer through the consumption of vanadium supply that was formerly available to end users from other countries. 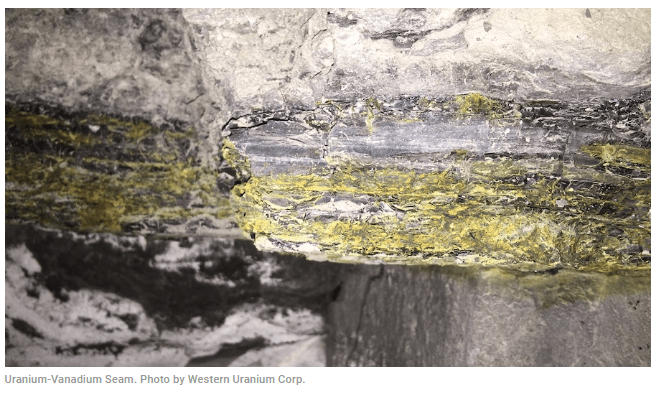 Consequently, Western is in discussions with multiple potential customers and joint venture partners who are requesting ore samples,” the company said in a press release. The West Kytlim alluvial platinum mine, in the Ural mountains of Russia, finished the 2018 mining season with total raw platinum production “well in advance” of company estimates, listed miner Eurasia Mining reported on Thursday. The mine delivered 165 kg of platinum, or 165% of company estimates, executive chairperson Christian Schaffalitzky reported.